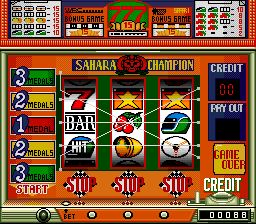 Yet another slot machine game. The last screen shot is in double width, open it in a new tab and have a look. 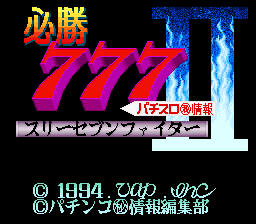 This game is sometimes written as Hisshou 777 Fighter II - Pachi-Slot Maruhi Jouhou; this is the GoodSNES and NSRT title. This is the second in the series, the first is Hisshou 777 Fighter - Pachi-Slot Ryuuguu Densetsu and the third is Hisshou 777 Fighter 3 - Kokuryuu Ou no Fukkatsu.